On 15 January 1850 was being born in the village of Ipoteşti, near of Botoşani (then located in the Principality of Moldavia), Mihail Eminovici, the seventh of eleven children of George and Raluca Eminovici. He spent his childhood in Botoşani and Ipoteşti, then he attended school in Cernăuţi, in Bucovina (then in Austria-Hungary). 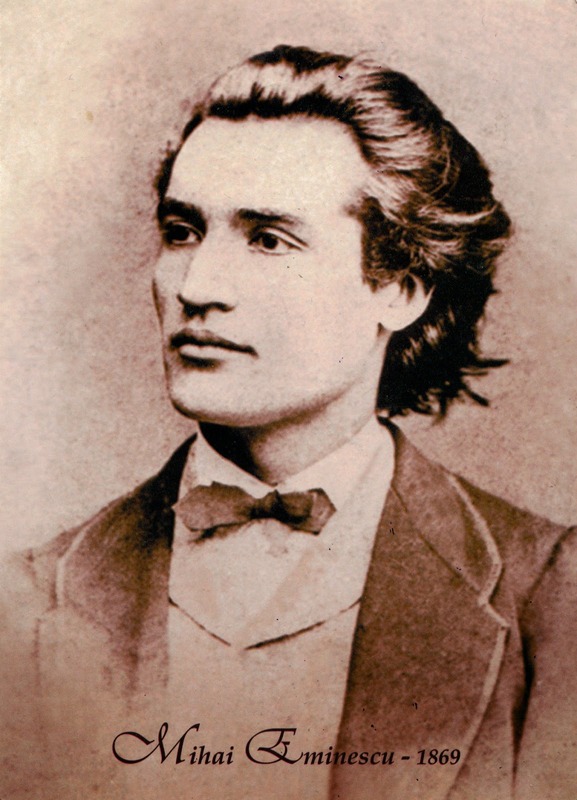 The first evidence of Eminescu as a writer is from 1866, when he published the poem La mormântul lui Aron Pumnul (At the Grave of Aron Pumnul) in a booklet issued by the students on the occasion of the death of their teacher. Another poem was published in Iosif Vulcan's literary magazine Familia in Pest, and this began a steady series of published poems. Iosif Vulcan, who disliked the Slavic suffix "-ici" of the poet's last name, chose for him the more Romanian "nom de plume" Mihai Eminescu. Since 1867 he joined to some theatrical troupes as a clerk and prompter, and at long last he settled in Bucharest, where became a clerk and copyist for the National Theater. He continued to write and publish poems, and began his novel Geniu pustiu (Wasted Genius), published posthumously in 1904. Between 1869 and 1872 he studied in Vienna, at the Faculty of Philosophy and Law. He was active in student life, befriended Ioan Slavici,, and came to know Vienna through Veronica Micle, the love of his life. He became a contributor to Convorbiri Literare (Literary Conversations), edited by Junimea (The Youth). The leaders of this cultural organisation exercised their political and cultural influence over Eminescu for the rest of his life. In 1870 he became a journalist for the newspaper Albina (The Bee) in Pest, and from 1872 to 1874 he continued as a student in Berlin. From 1874 to 1877 he worked as director of the Central Library in Iaşi, substitute teacher, school inspector for the counties of Iaşi and Vaslui, and editor of the newspaper Curierul de Iaşi (The Courier of Iaşi), all thanks to his friendship with Titu Maiorescu, the leader of Junimea and rector of the University of Iaşi. He continued to publish in Convorbiri Literare, and became a good friend of Ion Creangă, whom he convinced to become a writer. In 1877 he moved to Bucharest, where until 1883 he was first journalist, then (1880) editor-in-chief of the newspaper Timpul (The Time). During this time he wrote most of his notable editorial pieces, and also his greatest works. In his last years (1883-1889), he was diagnosed with differing disorders. Hospitalized in inappropriate places and treated by incompetent physicians, he suffered not only physical, but moral, distress and died prematurely, on 15 June 1889 (aged 39). He was soon proclaimed Romanian's national poet, because he was received as an author of paramount significance by Romanians in all provinces. Even today, he is considered the national poet of Romania, Moldova, and of the Romanians who live in the Ukrainian occupied part of Bucovina. He defined himself as a Romantic, and this designation, his untimely death as well as his bohemian lifestyle had him associated with the Romantic figure of the genius. His poems span a large range of themes, from nature and love to hate and social commentary, and frequently used metaphysical, mythological and historical subjects. His life, work and poetry strongly influenced the Romanian culture and his poems are widely studied in Romanian schools. Notable works include Luceafărul (The Vesper), Odă în metru antic (Ode in Ancient Meter), the five Scrisori (Epistles), Doina (the name is a traditional type of Romanian song), Floare albastră (Blue Flower) and La Steaua (To the Star).From 2011, on January 15, the day of birth of Mihai Eminescu, in Romania is celebrated the National Culture Day. Following Mihai Eminescu remaining four photographic portraits. First (on the postcard) made in Prague, in Wenceslas Square, in 1869, the best known and on which was built the myth of genius, is an unretouched portrait taken hastily by the Czech photographer Jan Tomáš, when Eminescu have 19 years old. Is it the "official" portrait of the poet, who is featured in the Romanian Literature manuals: almost sculptural profile, high forehead, hair thrown back, bow tie. 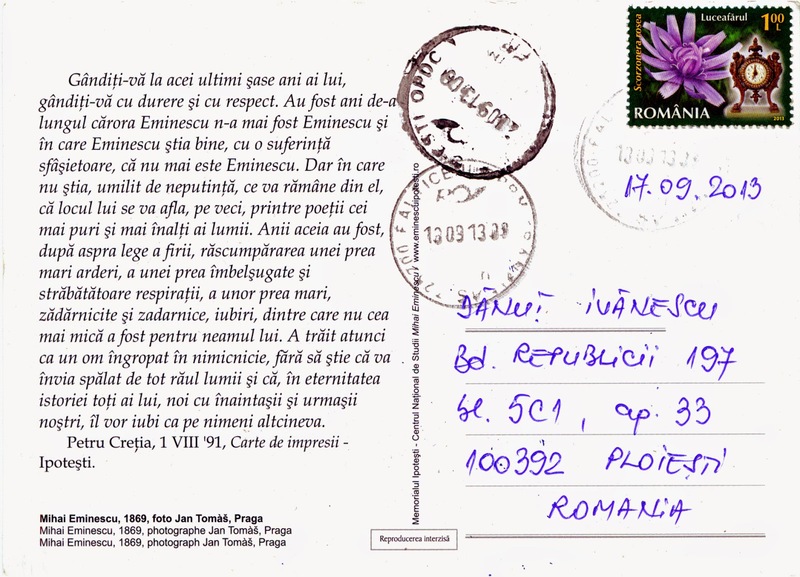 Harieta Eminescu, younger sister of the poet, mentions in a letter to Cornelia Emilian that her brother was photographed for the "favor" of Veronica Micle. The stamp, depicting Viper’s Grass (Scorzonera rosea), is part of the series Flowers’ Clock (I), about which I wrote here. 1420 UNITED ARAB EMIRATES (Dubai) - Got milk?